Extraterrestrial Filmed In The Peruvian Amazon - El Hombre De Quives! Here is the official write up from Hale Kaden, editor and Investigator of the Unknown, UFOs, Abductions, missing time, and the Paranormal for the State of Maine, USA. Editor's Note: From a personal standpoint, I am posting this report reluctantly. Quite a few of our readers have written and asked me about the video below, and the truth is, I can't say for certain, but my first impression is that it looks genuine. If any of you video experts can provide supportive evidence, send me your findings and opinions, and I will consider them. UFO activity in Peru seems to have reached new heights recently with reports of sightings becoming almost a daily occurrence. Many are convinced that a secret UFO base exists somewhere in the region, possibly disguised by a lake (Lake Titicaca?). A disproportionate number of UFO sightings do seem to involve bodies of water in this part of the world. Now this video that might contain footage of an actual Extraterrestrial is making national headlines and causing a sensation amongst UFO and alien hunters in Peru and abroad. The video was taken in the Santa Rosa de Quives region of the Canta province. The area is considered to be holy to Peruvian Catholics and a place where people come to pray for miracles. Every August 30, a pilgrimage takes place here and it is believed the video was shot at that time last year, however only made public this month. The creature depicted in the video is being referred to as Quives Man. The story has been covered by Peru's Capital Radio and Panamericana TV station as well as Channel Peru. Needless to say, English language media have not picked up the story (that is until now). A group of ufologists in Peru have carried out an analysis of the video and claim it contains a real alien. The Peruvian government and scientists are looking at the video as well. The video can be seen below: Does it show an actual alien? You be the judge. My Gastronomical Nirvana At Gaston's La Mar In Miraflores, Peru 2007! With the much anticipated grand public opening of La Mar in San Francisco next week, here are a few pictures and images of the gastronomical nirvana I experienced at Gaston's La Mar Cebicheria and other places in Miraflores, Chorrillos, Lima, and Iquitos-Peru on Oct 8-22, 2007. The pictures will give you a little glimpse of the rapidly emerging country of Peru and their delicious cuisine. According to the Economist of England, Peru is currently the fastest growing economy in all of Latin America and third fastest in the world after China and India. 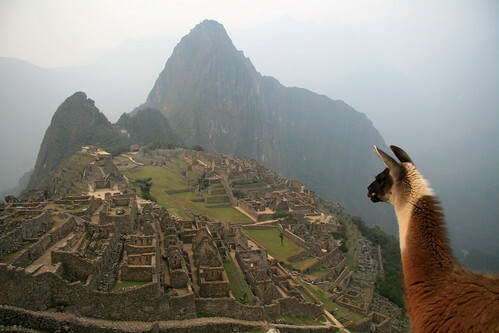 In Latin America, Peru is currently all the rage - cuisine, tourism, economy, gold & silver, nightlife, history, etc. Looking at my 750 Kilogram (roughly 28 Oz.) Asado Argentino at El Hornero in Chorrillos, Peru. Dining at the JW Marriotts in Miraflores, Peru. "Chyna", Iris, and JohnCarlos (me) at the JW Marriotts in Miraflores, Peru. At a super restaurant in Iquitos, Peru overlooking the Amazon River!!! At the main bar at the JW Marriotts in Miraflores. Another view of the Amazon River in low-tied from that restaurant in Iquitos. I would like to go back to this restaurant during high-tied season. With Stephanie at a high energy club in the "El Calle Ocho" district in Miraflores. Enjoying a delicious "Tiradito" in a restaurant at the LarcoMar Center in Miraflores. At the very posh Brazilian jeweler H. Stern in the JW Marriotts in Miraflores. That is where I got that "Phat" gold ring made of the Inca God! Enjoying the first night in Miraflores, Peru with Stephanie and her girlfriends at that "Calle Oche" nightclub in Miraflores. Poster of the super hot 2007 Peruvian Brahma beer girl - Jessika Grau! The Brazilian beer brand is "Gorilla Marketing" hard to penetrate the very lucrative Peruvian beer market. They are hiring all the hot Peruvian models to help them sell Brazilian beer in Peru. Dining at a excellent local restaurant in Chorrillos, Peru. Looking at my "Cebiche Tumbes - Cebiche de Conchas Negras" at Gaston's La Mar in Miraflores. My drink in La Mar - Pisco Sour Classic! One of many different kinds of Cebiches we ate at La Mar in Miraflores. With "Chyna" at Lar Mar, Miraflores. Me, Chyna, Ronald, & Iris - Having a great time at La Mar in Miraflores, Peru. A view of "La Costa Verde" (Miraflores Pacific coastline) from the LarcoMar Center, Miraflores, Peru.